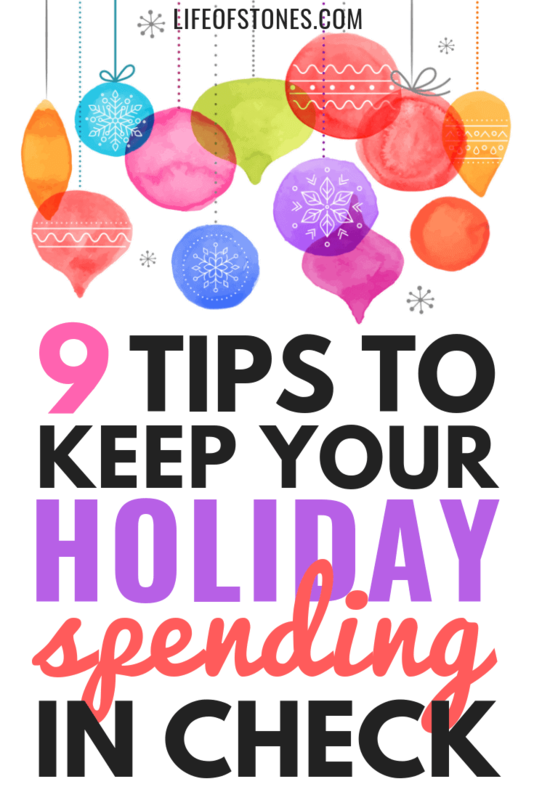 9 to help you control holiday spending and create a holiday budget you can stick to! Whether we like it or not, the holiday season is fast approaching and you need to be prepared so you don’t wake up on January 1st with a holiday hangover! No, not the kind you get from drinking too much eggnog, the kind you get from realizing how out of hand your holiday spending became and feeling sick when the credit card bills start rolling in! I can’t help you when you drink too much but I can help you save for the holidays and create a holiday budget you can stick to! Wouldn’t it be nice to be able to enjoy the holidays this year instead of it being a 3-month long stress-fest? Wouldn’t it be nice to start the new year off with hope and excitement rather than fear and regret? I know exactly how that feels and I know this year will be different for us, and it can be different for you too…check out these 9 tips for creating a holiday budget you can stick to! Once the holiday season is over most of us don’t even want to think about the holidays for another year! In today’s society, we are inundated with the holidays, especially Christmas, before Halloween even arrives so it’s understandable that we’d want to file it away, but getting a jumpstart on your holiday planning can make all the difference between a successful or unsuccessful holiday season – financially speaking. The easiest way to do this is to look at the expenses of the last holiday season. What did your holiday spending look like? What was your total output for the entire holiday season? Was this a good number for you? Maybe it was much more than you wanted to spend or maybe you’d like to cut back in future years? Estimate what you ideal total holiday expense would be. Divide that number by twelve. Plan to save that amount each month throughout the upcoming year. For example: If I plan to spend $1,000 as my total holiday expense, I would add a line item in my monthly budget for Holiday Savings: $120/month. Come the following holiday season, I will be ready to go with the $1,000 I have saved throughout the year and the holidays really won’t impact my budget any further the following holiday season! This is called a “sinking fund”. You can use a sinking fund for any future expense you need to save for. A holiday sinking fund is such a great way to be proactive with your holiday spending and ensure you don’t find yourself in a situation where you need to turn to credit to cover all your holiday expenses! Taking some time to create a solid, realistic holiday budget can save you hundreds (maybe even thousands) over the holiday season! 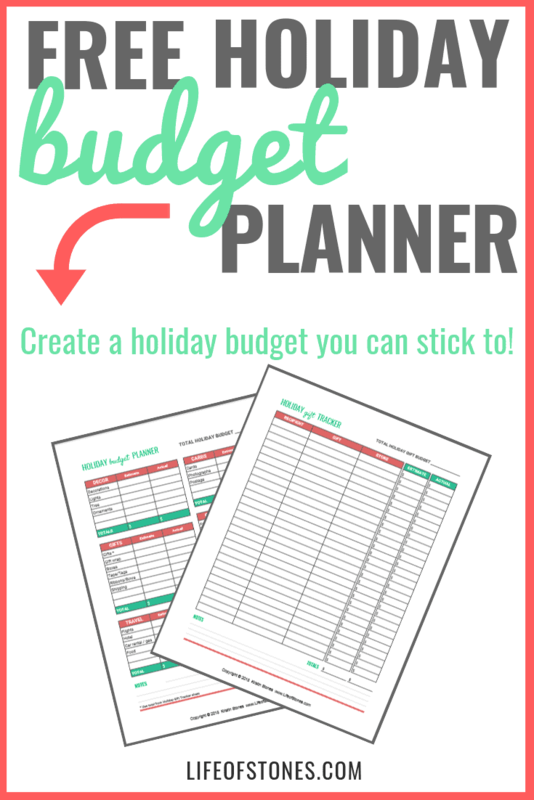 You can download this FREE Holiday budget planner to walk you through setting up a holiday budget. When creating your holiday budget, be sure to include all expenses for the entire holiday season. Have a quick brainstorming session and jot down all the things you spend money on during the holidays. This will look different for everyone. For example, I don’t budget Halloween costumes since we use money from our “kid expenses” cash envelope. We also don’t have Thanksgiving expenses since we don’t host. We usually just grab a pie on the way to dinner! Remember to review your expenses closely. Did you include charitable donations? Do you send holiday cards? Maybe you get family photos taken each December? If you have substantial expenses for these holidays then they should be included in your holiday budget! If you celebrate Christmas or Chanukah you will likely have a larger gift expense. 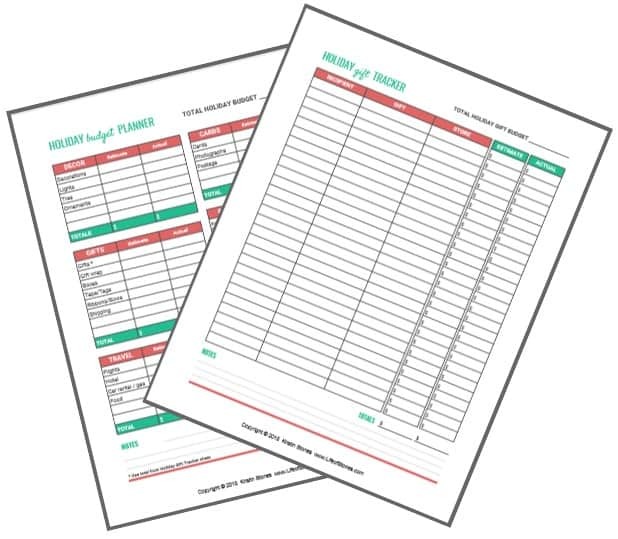 Download your FREE Holiday budget planner and gift tracker below to help you plan out your gift expenses! 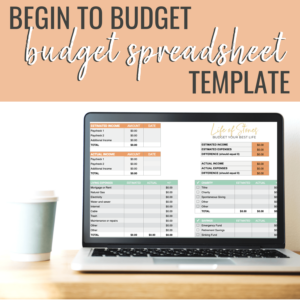 You’ll want to estimate each expense and be sure to come back to record the amounts actually spent so you can evaluate the accuracy of your budget! Setting a holiday budget is one thing. Sticking to your budget is another! Tracking your expenses is an essential – and often overlooked – part of budgeting! If you don’t keep track of what you actually spend you’ll never know if you finished out the season over or under budget! Realizing you’re under budget means you have extra money you could use to pay off debt or put towards your summer vacation! Catching yourself going over budget will help you revise your holiday budget to get you back on track! It’s important to set expectations around the holidays. This means you’ll want to be careful when estimating your holiday expenses. Entering $500 for your total gift budget knowing it’s likely you’ll spend closer to $1,000 is setting yourself up for failure. Itemizing and reviewing each expense will make sure you set yourself – and your holiday budget – up for success! It can also be beneficial to set expectations with your family and friends. If you will be operating on a smaller holiday budget than normal, having a quick chat with them to explain you can’t afford a fancy gift this year will alleviate any disappointment on their end and any guilt on your end! Check out my list of 10 frugal gifts for the person who has everything…hint: they are fun and unique – but more importantly – they are cheap!! Another option would be to suggest a gift limit that everyone would adhere to so all gifts are within the same price range! This will eliminate any guilt spending on your part! This may seem obvious but another perk to saving for the holidays throughout the year is the ability to also make purchases throughout the year if the price is right! Keep your Christmas savings in a fairly liquid state that you can easily access if you happen to come across the perfect gift at the perfect price during the summer! We love keeping ours in our Capital One 360 checking account, which gives us a debit card we can swipe if we want to make purchases using that account or a Capital One 360 savings account, which earns a ton more interest than your local bank, it won’t make you rich, but if you’re saving all year long, you might as well earn a few extra bucks, right?! Purchase the gift using your non-Christmas savings then easily transfer that amount from your Capital One account and it will be back in your bank account in 2-3 days! You can get $25 when you open a Capital One account! Being able to take advantage of rock-bottom sale prices will help you stretch your holiday budget and get more bang for your buck! Don’t forget to use Ebates for all your online shopping! I do a ton of shopping online during the holidays to avoid the crowds… every time I am ordering I use Ebates and earn cash back on most purchases! It’s SO easy and basically free money! You can earn $10 for free when you sign up (plus you can then refer your friends and earn CASH for each referral…it’s seriously awesome) and save money on a ton of your holiday shopping! I don’t necessarily condone using credit cards to play the points game as most people will eventually lose and find themselves in credit card debt, but if you are a master at utilizing credit cards to maximize the benefits and rewards then the holiday season is a great time to put them to good use! Studies show that 31% of people don’t redeem their credit card rewards?!? That’s FREE money going to waste! Did you know that you don’t have to spend your credit card points on airline tickets?? Did you know that most credit cards allow you to cash your points in for gift cards, sometimes even discounted gift cards? Each year I cash my points in for gift cards, usually $5 Starbucks cards that I can give for teacher gifts, bus drivers, co-workers or even just to brighten a stranger’s day who might be stuck in a long line for their morning coffee! If giving gift cards isn’t your thing another option is to select gift cards for personal use for purchasing Christmas gifts! Cash in your points for Target or Amazon gift cards to buy your kids’ gifts, Lowes or Home Depot if your Dad is hoping for tools, etc! Remember to check for any gift cards that might be on special as you will get them at an even bigger discount! There is no denying how hectic the holidays get! The constant rush makes it easy to eat out more often, grab more fast food, coffees, and treats! Not to mention the holidays are usually filled with more social events, parties, and other gatherings. Being conscious of your budget and other non-holiday expenses during this time is imperative since it’s so easy to overspend. Don’t neglect your budgeting during the holiday season! A holiday budget should be separate from your everyday living budget. Sticking to a cash system is a great way to reduce extraneous spending during the holidays! Swiping a credit card for all purchases means you’re not “feeling” the money you spend since you have no emotional connection to credit cards! The holiday season is a great time to review and revise your living budget. Take a look at your social obligations throughout the remainder of the year. If you have multiple holiday parties and work potlucks, consider reducing the amount you allocate in certain budget categories during the holiday months. 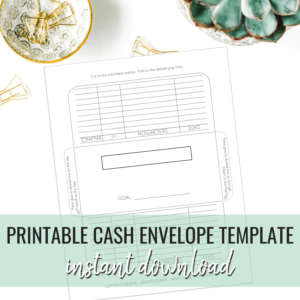 You might be able to greatly reduce some budget categories such as your entertainment budget, restaurant budget, or your overall grocery budget…saving you money and freeing up more cash for hostess gifts and potluck contributions! Are you the hostess with the mostess? Spending large amounts of money to hold the large family Christmas or Thanksgiving dinners at your home each year? These parties can really take their toll on your holiday budget! Get creative and consider making some changes to your family’s traditions! Now, part of the point of traditions is doing the same thing each time, but who’s to say a few tweaks would make a big difference? Most holiday traditions center around the central theme of spending time with loved ones! Try switching to a rotating schedule. Switch the location each year to relive the host of the financial burden! If that’s not an option, keep the location the same but switch the hosts each year. A different person (or family) can do the shopping or pay for the meal each year! How about a potluck? Having a potluck not only lightens your budget, but it also adds some variety to your holiday buffets! The holidays season should be filled with joy and love, following these holiday budgeting tips will help reduce holiday financial stress and allow you to keep your focus on the true meaning of the holidays!